Tropical Cyclone 04A --AS-3---continues its Northward track. Earlier, Vagaries had mentioned it could curve Northwards after crossing the 13N latitude. Expected to track N/NW . 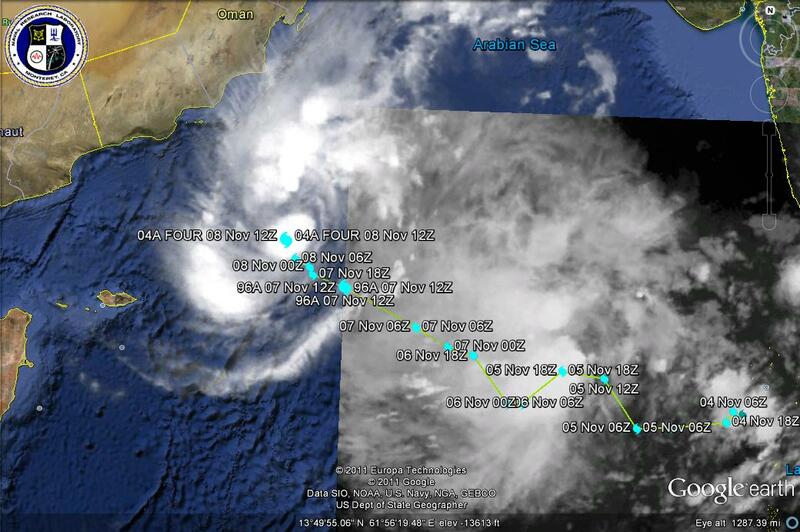 Storm Near Oman. Surge Maintained. AS-3 moves N/NW and positioned at 14.4N and 58.4E on Tuesday night. Note, it has now taken a more Northerly track (see Sat. Image above) as estimated by Vagaries. Core pressure at 996 mb is constant and winds at 30 knts. A slight curvature of cloud formation is now also seen in the South of the system. Southern Oman coast, and city of Salalah can expect squally weather with intermittent rains from tonite and on Wednesday. Muscat will be cloudy with light rains on Wednesday. I expect the system to move N/NW and weaken. Hence rainfall and stormy conditions will decrease in coastal Oman from Thursday. Remnants clouding of AS-3 is now being pulled towards the east by the upper winds. Precipitation along this NE course in the Sea between the Oman and Pakistan coasts could be expected, and some rains along the Western region of Sindh coast from Thursday. As mentioned yesterday, Karachi was cloudy on Tuesday, and will continue to have cloudy weather on Wednesday, with light drizzle on Thursday.